Strawberries are one of my favorite summer fruits! 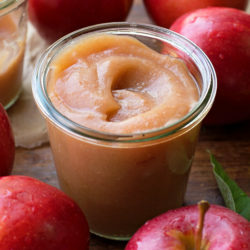 I love to snack on them and use them in desserts. 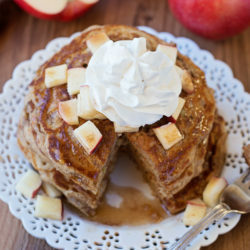 Today’s recipe just happens to be a treat I decided to make on a whim. I wanted something light and sweet but didn’t want to spend a lot of time making it. And since it was just going to be for me, I definitely wanted something small. 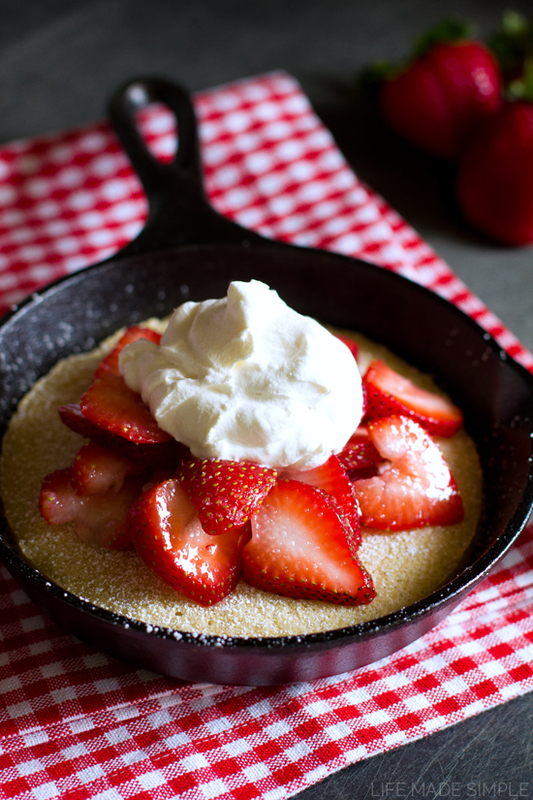 This individual strawberry shortcake skillet was perfect! When I was working at Sur La Table I was always fascinated by all of the cast iron skillets we had. They came in a variety shapes and sizes… I was especially fond of the miniature ones. So before I left I made sure to purchase one. I’ve used it a few times over the past few months and have LOVED it! I plan on making a lot more recipes in it (just a warning, so be prepared)! But since the skillet is so small, I had find a recipe for a cake that would work. I came across a cupcake recipe for two and altered it a bit. The recipe is rather simple, you’ll most likely have everything on hand. I opted to use cake flour for a lighter and more tender crumb, you can easily make your own following this tutorial. I also used pure cane sugar in place of granulated sugar. I’m kind of in love with it. 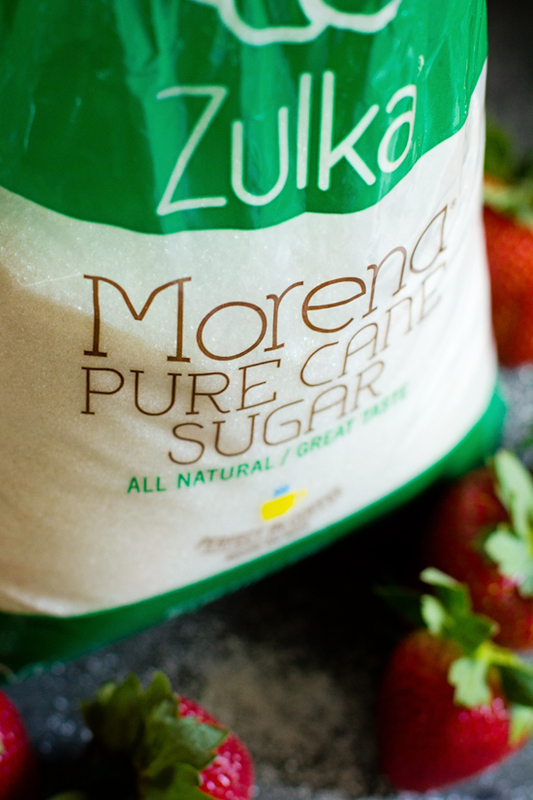 Zulka® Morena® pure cane sugar is my preferred choice. It’s less processed and has more natural flavor and sweetness to it. So when I can I like to use it, especially with fruit or when rolling/topping treats like these perfect peanut butter cookies. But these are just substitutes to fit my personal tastes, all-purpose flour and granulated sugar will work fine too. Back to the recipe, start by combing the egg white, sugar, vanilla and lemon zest in a small mixing bowl. Once you’ve mixed the ingredients together, add the melted butter and incorporated. Place the dry ingredients in a mesh sieve and tap in a circular motion over the bowl of wet ingredients. That way the you’re “sifting” the dry ingredients and adding a bit more air into the batter. More air = a lighter cake (something we definitely want, especially with strawberry shortcake). Once all of the dry ingredients are in the bowl, fold them in and add the milk. Gently combine until a thick batter forms. 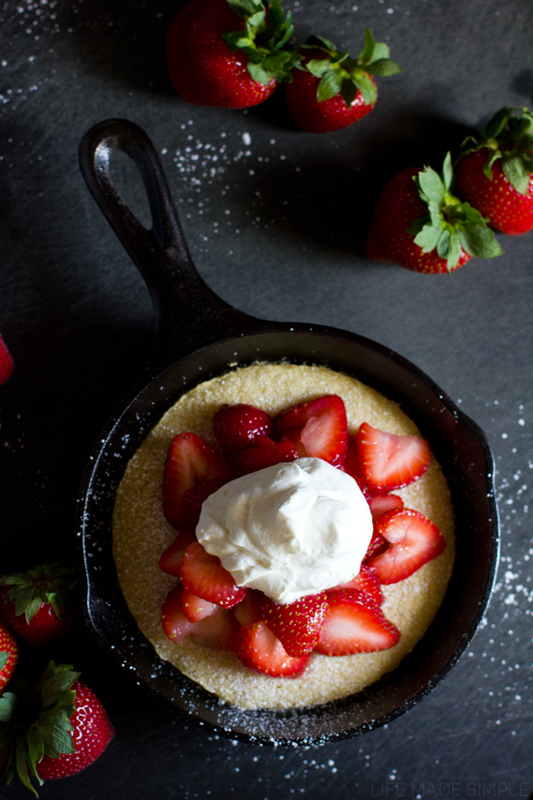 Scoop the batter into the skillet (or ramekin) and smooth with a spatula into an even layer. Place in the oven and bake until lightly golden brown around the edges. 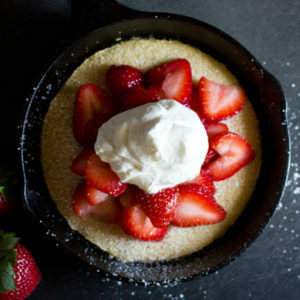 Tender sweet vanilla cake topped with fresh strawberries & homemade whipped cream. 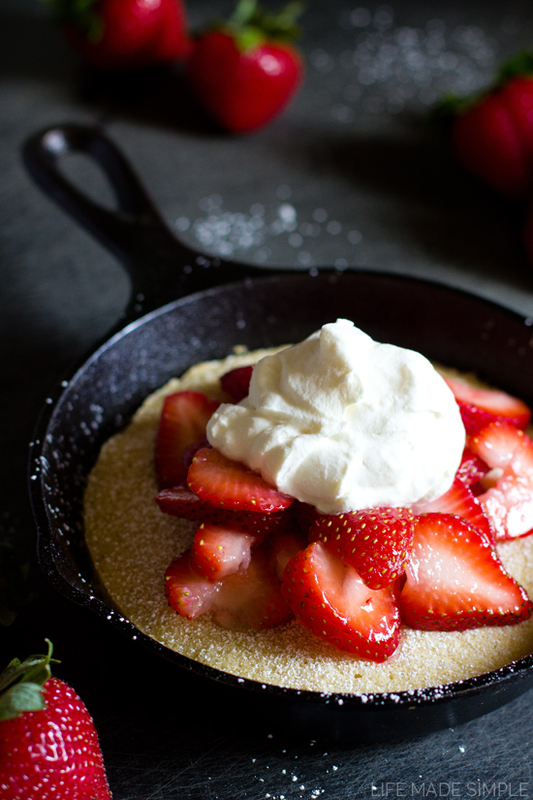 This individual strawberry shortcake skillet is the perfect summer treat! In a small mixing bowl, add the egg white, sugar, vanilla and lemon zest, whisk until combined. Add in the melted butter and stir until mixed. Add the cake flour, baking powder and salt to a medium sieve, place over the bowl and tap over the bowl. Once all of the dry ingredients have been "sifted" into the bowl, stir until smooth. Stir in the milk. Pour the batter into a mini skillet (SEE "NOTES" BELOW) and bake for 10-12 minutes or until set. While cake is cooling, slice strawberries and toss in sugar. 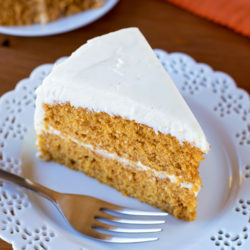 Prepare the whipped cream by whipping the cream and sugar until soft or stiff peaks form. To assemble, dust cooled cake with powdered sugar, add strawberries and top with whipped cream. -You can use a 5" or 6" ramekin, skillet or pyrex bowl (as long as it's oven-safe). This is NOT a sponsored post from Zulka®. Though I have been given free samples, all opinions are my own. How adorable! I love this idea! I’m a strawberry obsessive so I’m hoping I get to try this soon!